I’ve just been looking at Martin’s latest photo ‘Trains’ on the Ashton Blog which shows Ashton Charlestown Station as it is today. 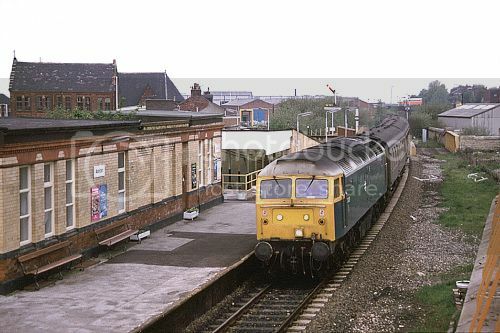 Ashtonians may be interested to compare it with my photo of the station from 1985 below. I would have thought the brown brick building on the left of my photo would have been swept away but it seems to be still there. Can anyone tell me what it is used for today – I can’t remember. The station building seems to have acquired a new sloping roof. Do you remember the livery on the bus crossing the bridge – were they SELNEC colours? That's the Independent Methodist Church. Sorry for the confusion folks - yes I meant the building in the background on the left not the station building. From the photo it seems to be a candidate for demolition but obviously not! Ah yes - I remember it now. Was there a Polish Club or suchlike at the side of it? Perhaps it's the building on the right of Bill's photo. It remember the orange and white livery some the buses but I don't think they were Ashton or Oldham colours. Possibly South East Lancashire North East Cheshire? One of our WEA classes takes place in this chapel. Victor Blunden teaches all aspects of Ancient Egypt. Its a GMT Bus. SELNEC i think had orange roofs, GMT White. Mmmm ... 877 AD - the church is older than I thought!